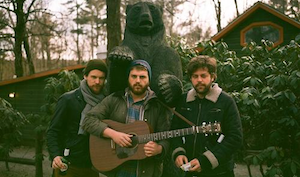 Bear’s Den are a British alternative rock band from London formed in 2012. Members: Andrew Davie (lead vocals, electric guitar, acoustic guitar) and Kevin Jones (vocals, drums, bass, guitar). Bears Den just released their new single ‘Dew On The Vine’, taken from their second album, Red Earth and Pouring Rain.